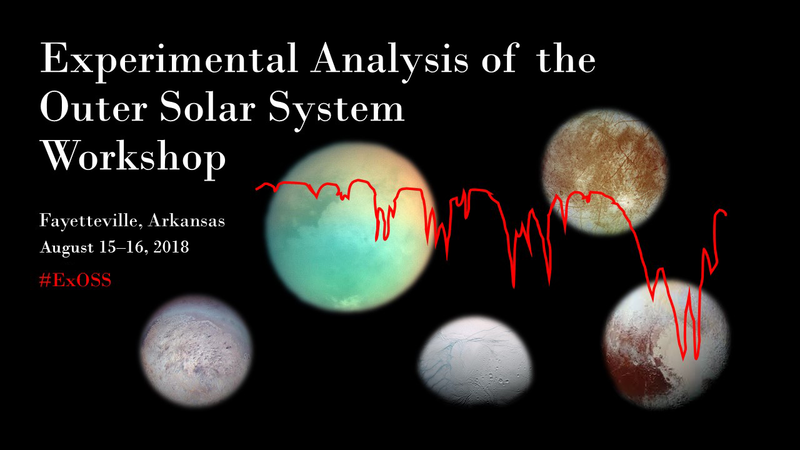 The Experimental Analysis of the Outer Solar System Workshop will be held August 15–16, 2018 at the University of Arkansas Walton Conference Center, 145 N Buchanan Ave, Fayetteville, AR 72701. The purpose of this two-day workshop is to gather and network those who work specifically in the experimental regime of the outer solar system and share ideas for improving instrumentation in the laboratories. Specifically, we aim to advance our understanding of the processes that lead to geophysical and atmospheric behaviors and verify the likely mechanisms responsible in a laboratory environment. This workshop provides an ideal setting for continuing and new collaborations.